The independent and problem-solving type. They are especially attuned to the demands of the moment [and] are masters of responding to challenges that arise spontaneously. They generally prefer to think things out for themselves and often avoid inter-personal conflicts. The Mechanics enjoy working together with other independent and highly skilled people and often like [to] seek fun and action both in their work and personal life. They enjoy adventure and risk such as in driving race cars or working as policemen and firefighters. I would never, ever, EVER have imagined that I would ever be described as a mechanic! Seriously, I am just not logical or pragmatic enough, in my opinion. But… perhaps this opinion is somewhat outdated? Maybe the work I have engaged in recently – as well as enduring a four year, lab-based PhD project – has moulded me into someone new? Unfortunately, none of my present friends (online or offline) have known me for long enough to validate this hypothesis – and my parents are too close to notice such a change – so it's all unproven theory for now. I knew there was a reason that I loved doing these tests! Does anyone remember E-mode? I am sure it was a personality test website, hugely popular back in the early naughties… Or was it a figment of my youthful imagination?! Interesting. I came to be doer in my Shahrazad blog. I could’t think my blog would be that. On the other hand, my Persian blog came to be “thinker”. I used to write there for about seven years. Then now since i’ve had my english blog, i have less time to update my persian one. Hmm .. I don’t know about the efficacy of this test. Your blog barely scores on spirituality and feeling?! Mine is high on spirituality etc. 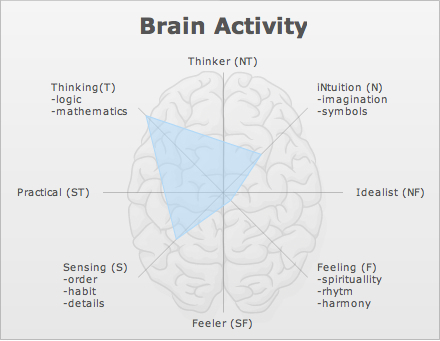 My triangle of thinking falls exactly between S and F.
wow, this was amazingly accurate i think. Shah and Specs are the exceptions so far. Umm Travis: I am so glad you remember too! I can’t find the site and I thought I was losing it! Shah: you have gone from studying (i.e., thinker) to teaching (i.e., doer)… so it kinda makes sense? BrownS: hmm… well, I guess I don’t write spiritual stuff on a regular basis, so I think it is an accurate assessment of my writing style so far. Allahu ‘alam. Specs: I think I quite like being a Mechanic… plus I don’t fit the Artist description at all! This is sooooo you, Shaz! This is the first time I’ve heard of ISTP’s described as mechanics! Seriously, though, you’re a biology major, followed by a lab-based PhD? This definitely points to the left-brained, thinking type, as is evident from the diagram. This is weird. Looks like I’m a ‘performer’ according to this test. Which I am not, btw :). I might be friendly and like to surround myself with sweet smells (who likes to surround themselves with bad smells, huh? ), but there’s no way anyone could ever call me ‘entertaining’. Actually, these last two sentences really do describe me. Have you tried the gender analyser yet? Marahm… Well, I guess I don’t know myself very well then! mummyjaan: mmmm, bad smells… yum yum. Yeah, not quite! Yusuf: wa ‘alaykum salam wa rahmatullah. I just tried it, and it says the writer of this blog is most likely MALE (78%)! No wonder people keep thinking I’m a guy – online, I mean… I think the hijab gives it away offline, hehe. I got the same Mechanics result using Irrelevant Opinions, and my little brain chart there looked almost exactly the same. The results seem to be using the Myers-Brigg personality indicators, which I’ve generally found to be quite accurate generally but I don’t think ISTP is accurate for me. INFJ, which is my result when doing a proper MB test, is extremely accurate for me. I remember you (Faraz) sent me a link to an MB test, and I scored ENFJ. Comparing the profiles of ENFJ to ISTP, I do feel that I fall more in the former category than the latter, as a whole person – as opposed to the mere snapshot that my writing reveals. But my emotional side is not so well represented on my blog – a combination of password protection, post deletions, and just not being keen to expose my emotional baggage to the world! Strange but I didn’t think I would be either. Think I’m going to do a blogpost like yours.